In today’s competitive business world, there is no such thing as being overqualified. And indeed, having a firm grounding of some of Adobe’s most famous and useful tools can really help set you and your business apart from the competition. Because in 2016 we are all participating in an extremely visual world of online marketing. The internet, and social media in particular, has transformed the way brands are perceived by the general public. These days, we all validate a company by typing a quick search into Google. And from there we first expect to find a website, and then a Facebook Page at the very least – but, what is more, we want them to look good. Now, of course, a lot of that will come down to web design – but not everything. Indeed, once our smart-looking websites have convinced a first time visitor that we’re professional and have a sharp eye for detail, we don’t want to lose this when they delve deeper into what we have to offer. The modern business will be producing printed marketing materials, online marketing materials, downloadable whitepapers (as PDFs), eBooks, eCards, business cards, and a whole lot more besides – and all of these things can be produced to an extremely professional standard using Adobe InDesign. 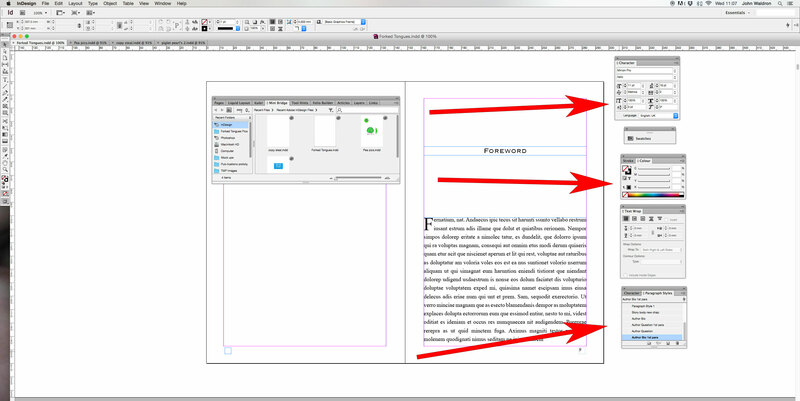 InDesign, however, is not a straightforward tool to use – especially for first-timers. It’s not that it’s particularly difficult, rather that it’s just so darn big. It’s enormous, in fact, and an incredibly powerful program to boot. Indeed, the thing that you will quickly learn when starting out with Adobe products is that they are professional tools, first and foremost. That is to say that they have not been designed to be user-friendly – and so coming at them as a complete beginner, with no guidance or formal training, can be an extremely daunting, and indeed off-putting, prospect. It’s not unusual for someone to fire-up a program like InDesign for the very first time, with a head full of truly magic ideas to create an absolutely stunning flyer to advertise an upcoming event or what have you, only to become stuck in the first 5 minutes, and after about 15 minutes abandon ship altogether. The problem comes with all the windows that pop up, all the tools with funny icons listed down the left of the screen, and the seemingly unlimited options from the menu bars at the top – where on earth do you start with it all? I must admit that when I first started using Adobe products I was intimidated. The learning curve seems very steep – and it is, to be fair, which is why by far the best option is to invest in some on-site training. Of course, there is a wealth of online tutorials out there that can get help you get started with InDesign and other Adobe products. But, to be perfectly honest, as handy as these can be to get you off the mark, the whole process of following a set of instructions, or endlessly pausing and rewinding a how-to video can become very tedious very quickly. In complete contrast, by attending a training course, where there’s an expert at the helm, slowly guiding you through the whole process with real examples that you can practice with, a first time learner of InDesign can become familiar and confident with the product in a matter of a few hours. Here at Creative Studios, we know just how daunting Adobe software can be – but we also know just how valuable Adobe skills are to have. And so we have designed our courses to deliver the maximum amount of knowledge in the most professional manner in a relatively short amount of time. And the secret is in small class sizes. Our maximum class size consists of just 5 learners. This enables us to deliver quality training to each and every participant, where everyone has access to plenty of one-on-one time with the trainer. We’ve found that this produces the best results – with small class sizes, our trainers have the opportunity to answer everyone’s questions and ensure that each and every participant understands and can apply the practices we are teaching them before moving on to the next. We’re proud of our courses, and know how valuable they are to businesses and individuals who want to stand out from the crowd. Here’s what you’ll get from a Creative Studios InDesign Training Course. And Don’t just take our word for it either –please take a moment to read our independently verified reviews over at reviews.co.uk to find out what our existing customers are already saying about our Creative Studios Courses.